Bill Sr “was a craftsman deep within his soul, and was only ever focused and passionate about his whisky”, Samuels continues, explaining that his grandfather’s ambition was “to make a flavour-forward, rich, creamy Bourbon in a world of ‘test your manhood’ whiskey”. In 1952 he bought land outside Loretto, Kentucky, which he renamed Starhill farm, and the old Burks’ Distillery that had been closed since Prohibition. He then cooked up the recipe for his Bourbon in the kitchen with his wife, Margie, using an oven instead of a still. The story, confirmed as true by Samuels, is that his grandparents decided on a mash bill flavoured with red winter wheat rather than more typical rye after baking seven different loaves of bread. “Rye has spice, but it’s also a little abrasive,” he says. “They wanted to get that bitter abrasiveness out of the whisky.” Being a whisky without an ‘e’, was just one thing that made Maker’s Mark different from its mainstream American cousins. For Maker’s Mark, this is the ‘Star S IV’ that is forged into the glass and appears on every label, the ‘Star’ for the farm, the ‘S’ for Samuels, and “‘IV’ because my grandfather was a registered fourth-generation whisky-­maker in the commonwealth of Kentucky”, says Rob Samuels. Most important, Margie thought up the wheeze of hand dipping the bottles in tubs of molten wax, leaving each with a glossy red head­dress that has come to define the brand. 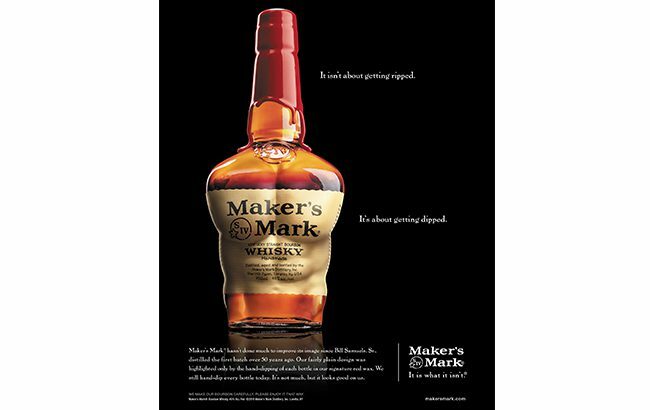 This gives Maker’s Mark some serious standout on the back bar and has inspired some nice ad campaigns. One roadside billboard featured a giant, floodlit bottle and the words: “Honk if you’re proud to be redneck.” The wax is still supplied by the same family business in Indiana as day one, while the ad agency has always been the local firm Doe Anderson. “My grandfather did not like traditional marketing,” says Samuels. “He thought the idea of screaming the loudest to connect with a customer was almost rude. What he wanted was a much more personal collaboration of treating a customer like you would a friend.” Doe Anderson was hired in 1973 when Maker’s Mark was selling just 35,000 cases a year and barely a bottle beyond Kentucky. It was still working on the account in 2016 when volumes had topped 1.3 million. One thing that helped it become a coast­-to-­coast brand in America was a judicious plug on the front page of the Wall Street Journal in 1980, which described Maker’s Mark as “a model of inefficiency by choice”. The family took this as a compliment, for, as Samuels says: “The goal was never to be the biggest or most efficient.” Hiram Walker bought the brand the following year, after which it passed to Allied Domecq, then Pernod Ricard and finally on to what would eventually become Beam Suntory in 2005. Samuels credits his father, Bill Samuels Jr, who became Maker’s Mark president in 1975, the brand team and the various owners for solving the question of: “How do you take what is the first craft distillery in America and patiently wait for customers and premiumisation within spirits?”, and then: “Once growth occurs, to carefully nurture expanding supply so that the whisky’s made exactly the same way into the future.” A second identical still had been installed in 2004, seven years before Samuels was appointed COO. Despite this, and the earlier financial crash that ought to have dampened demand, the thirst for Maker’s Mark kept growing. It was a nice problem to have, but a problem nonetheless, and in February 2013 the fateful decision was taken to reduce the bottling strength from 45% abv to 42% to expand supply. Other brands have done this, including Gordon’s Gin, which was diluted to 37.5% in 1992, but that was to cut tax and, crucially, happened in a pre­-digital age. The instant online backlash from Maker’s Mark activists provoked a squeal of brakes and a U-­turn within a week. “You spoke. We listened. And we’re sincerely sorry we let you down,” tweeted Rob Samuels and his father. Perhaps it wasn’t the smartest way to suppress demand, but it reaped plenty of free publicity, and it’s all water under the bridge now. 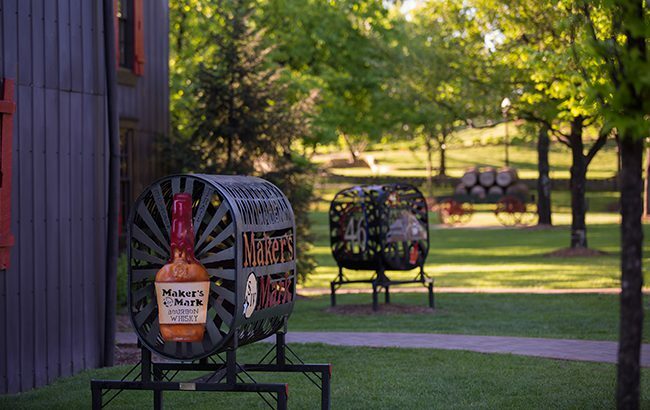 In 2010, the first range extension was released, called Maker’s 46, whereby Maker’s Mark was finished in special barrels containing an extra 10 French oak staves for nine weeks. The creatives at Doe Anderson were tasked with communicating a higher price without cannibalising the mother brand or making it seem inferior, and it seems they succeeded. Further innovation has included the distillery’s single barrel programme, launched in 2016, where top accounts can buy their own cask for around US$13,000. In 2014, just as Suntory was buying Beam Inc, a US$67 million investment in Maker’s Mark was announced, involving new warehouses and a third identical still to boost capacity by 50%. Given that Maker’s Mark is matured for some six years, the increased supply won’t become available until around 2021. At which point Maker’s Mark can embark on its next mission to seduce the world. Click through the following pages to see the timeline of Maker’s Mark’s brand history.